I have attended some great events this months, and slowly but surely I'm sneaking in event recaps during our annual holidays buying guide because I love to make you feel like you were there with me! 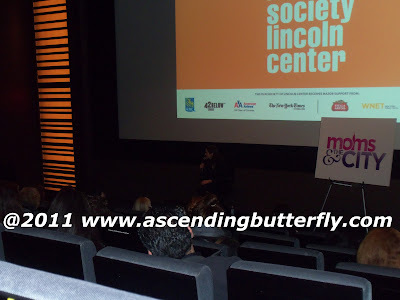 I had the opportunity to attend a special screening of the movie War Horse thanks to Moms & The City, the Film Society of Lincoln Center and a live stream of a questions and answers session with Actress Emma Watson that was live streamed by the New York Daily News! DreamWorks Pictures "War Horse" directed by Steven Spielberg is an epic adventure that tells the story of a very special friendship between a horse named Joey and a young man Albert who trains Joey, the adventure begins when they are forcefully parted due to The First World War. Joey changes and inspires the lives of all he meets including the British Cavalry, German Soldiers, and a French Farmer and his Grand-Daughter, meanwhile his friend Joey's life is forever changed in attempting to reunite with him. It's a heartfelt and touching tale of friendship, of the single thread that unites us all even under (or maybe especially under) dire circumstances, tenacity and friendship. I'd say the age range for young ones would entirely depend on your child's maturity level. There is some violence as this is a war epic after all! As if Mimosas, warm popcorn, bagels and other assorted snacks weren't enough incentive, the screening was followed by a Question and Answer session with one of the films stars, Actress Emma Watson! Emma Watson Center, holding microphone! I would definitely recommend checking out War Horse the movie which will open on Christmas Day! Emma is incredibly down-to-earth, (a bit shy! ), and super approachable, I enjoyed meeting her and greatly enjoyed the screening!